NORTH BAY, Ont. — What appears to be a minor move sometimes proves to be significantly more. 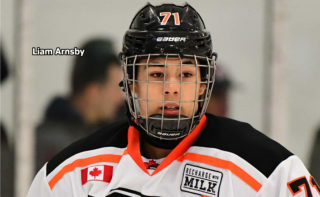 That may be the case with the North Bay Battalion’s acquisition of right winger Jake Henderson from the Kitchener Rangers at the Ontario Hockey League’s trade deadline for overagers Jan. 9. “He has been a very underrated player since he came here,” Stan Butler, Battalion director of hockey operations and head coach, said of Henderson after a key 3-2 victory Thursday night over the Oshawa Generals in which Henderson scored the winning goal. With the Battalion having dealt Brett McKenzie, the club’s leading scorer last season, and Cam Dineen, its most offensively dynamic defenceman, in the week before the trade deadline, the Henderson deal may have appeared an afterthought. 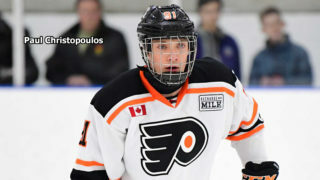 The Troops sent an eighth-round pick in the 2019 OHL Priority Selection to Kitchener for Henderson and a 10th-rounder in 2021. 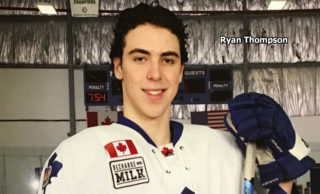 Henderson, a St. Louis native who was a ninth-round pick by Kitchener in 2013, became available after the Rangers got overage goaltender Mario Culina from the Sudbury Wolves. 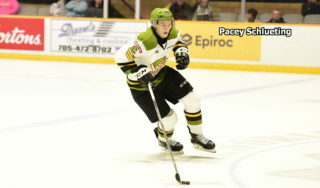 With teams permitted a maximum of three rostered overagers after the trade deadline, and the departure of McKenzie from the Battalion ranks, Henderson joined the Troops, filling the overage quota with defencemen Riley Bruce and Jesse Saban. Butler said then that Henderson’s acquisition also was meant as a message to the players that, despite trading McKenzie and Dineen, the Battalion wasn’t bailing on the current season. The signal likely was received, as the Troops, who had a won-lost-extended record of 13-19-6 after a 6-5 loss via shootout Jan. 4 at home to Oshawa, have gone 12-3-2 since then and are 25-22-8 for 58 points, third in the Central Division and tied with the Ottawa 67’s for fifth place in the Eastern Conference. 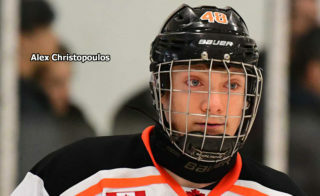 In part, Butler traded for Henderson to improve North Bay’s penalty killing, which showed a success rate of less than 80 percent when the transaction was consummated. The Battalion now is at 81.4 percent. Henderson, six-foot-three and 209 pounds, is a big body on the ice and a leader in the dressing room, despite not wearing a letter. 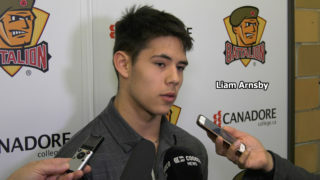 He has three goals and four assists for seven points in 15 games with the Battalion after scoring six goals and adding 14 assists for 20 points in 40 games with Kitchener. “He just checks so well and he plays on the right side of the puck,” noted Butler. After play Friday night, the Battalion, which hosts the Mississauga Steelheads at 2 p.m. Sunday, was two points behind the Niagara IceDogs, who lost 6-3 to the visiting Owen Sound Attack. The Battalion has won three of four games against Mississauga, rebounding from a 7-1 road loss Oct. 20. The Troops posted two home-ice wins, 4-3 on Dec. 7 and 8-3 on Dec. 31, before rallying from a three-goal deficit to a 5-3 victory Feb. 2 at the Hershey Centre. The Steelheads are 24-28-2 for 50 points, fourth in the division and eighth in the conference. The Battalion visits Oshawa at 2:05 p.m. Monday, the Family Day holiday, to complete its season series with the Generals before entertaining Sudbury at 7 p.m. Wednesday. “We’re basically going to have a three-in-four here going forward, so it’s really important for us to have a good run in these next couple of games,” Butler said of the unusual schedule. The Mississauga game features Epiroc Day in support of the Canadian Cancer Society’s Relay for Life.